I propose a mindset, let’s call it Plurality of Absolutes, as a solution. The essence of this mindset is that (1) different mechanisms drive the social world at different scales and that (2) most beliefs can be justifiably held as long as one restricts scope. The boundary that separates different rules in this view is that of a group. Groups are defined by a shared purpose and by loyalty of their members. Each group is its own world. Approximately anyway – groups can contain as few as one person, each person can belong to multiple groups, and there is choice in group membership. Only within this smaller world do the values, passions, and goals that drive and define you have any meaning. Only the opinions of those within this world are relevant to your sense of self-worth. Interactions with other worlds operate by amoral rules and add randomness and constraints to your life in the same way that nature adds randomness and constraints to our physical world. 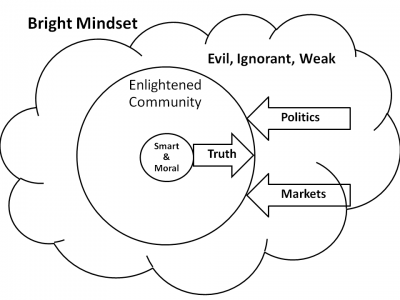 In a nutshell: morality within, markets and politics between. This idea is by no means new – it is, in fact, as old as humanity. This used to be the standard way to view the world. It is still a close approximation of how the world actually works – a lot of angst comes from efforts to deny or overcome this fact. Properly understood, this view replaces unresolvable disagreement with productive action. The required acceptance of limited scope is a reality that we are unlikely to transcend anytime soon. 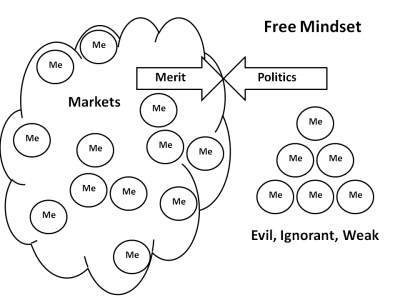 We can understand this mindset better by examining two other mindsets, which I call the Bright and Free. They not only frequently appear in arguments, but get us close to the Plurality of Absolutes when synthesized together. At the root of the Bright mindset is belief in universals. Human beings have universal needs and attributes which enable mutual understanding and common purpose. We are inherently social creatures and are happiest and most productive when we are a part of a community. A community that is moral and just, that benefits from our efforts, that recognizes our contributions. The essence of progress is to get closer to this goal. Once universals are identified, there is no absolute limit to the size of the community that can be built on top of them. Pragmatic challenges can be overcome with improved social and technological systems. Uncertainties in knowledge can be overcome with honest pursuit of truth. Disagreements can be resolved with a good-willed search for optimal answers. Progress brings the Bright truth to an ever larger number of people who join in and accelerate progress. Since Bright solutions are universal, they require, or at least strongly benefit from, universal participation. Until then, they are temporary, sub-optimal hacks. This, combined with the Brights’ near limitless faith in truth and argument, causes them to engage in a lot of passionate debates. The Brights are often genuinely shocked by disagreement. They present truth in the most objective way possible, but sometimes people refuse to acknowledge even facts that Brights consider self-evident. Since their intentions are noble and arguments clear, Brights blame disagreement on ignorance, weakness, or bad faith of the dissidents. Ignorant people don’t have the tools to understand the argument being made. Weak people don’t want to make the sacrifices required to join the Brights. Evil people actively suppress the truth because an alternate world suits their interests better. Since the Brights often hold a high opinion of human potential, they tend to blame Evil manipulation for the ignorance and selfishness of those unpersuaded by the Brights’ arguments. Good people united by a common purpose and guided by objective principles is the most noble and powerful force, according to the Brights. They view Markets and Politics as Evil weapons used to divide and suppress this force. The Brights see themselves as engaged in a David vs Goliath battle between Truth and Selfishness. As Truth wins over the Ignorant and the Weak, the community of the Brights expands and becomes stronger in the battle against Evil. Eventually, we’ll be a single world-wide community, powerful enough to convert, suppress, or eliminate the small number of the Evil bad apples. It might seem that the Brights are idealistic narcissists with delusions of grandeur and little experience. But they are not to be dismissed so easily, not the best of them anyway. The Brights are frequently smart and hardworking – a disproportionate number of the brilliant and capable is in their ranks. Their confidence in truth, in progress, in solutions comes from voracious learning and real experience with building, with solving problems. They’ve modeled complexity and overcome it in the past, multiple times, and they’ve gotten better and more confident each time. They’ve faced the charges of idealism and grandeur and succeeded nevertheless. They’ve seen things called impossible that weren’t even difficult. And they’ve accomplished things that looked impossible. They have good reasons to have faith in their vision and to blame the lazy, ignorant, and selfish for turning the possible into impossible. The Brights’ sense of human capabilities and possibilities isn’t just wishful thinking. They developed it through personal experience, careful study, and good-faith introspection. They applied these theories to themselves and tested them in real projects. They know that what they propose is a better existence and is within human potential. They just want to apply what they know on a larger scale. Their assumptions and processes really are crucial to their own success and really are one of the roots of progress. The Brights are frequently right about deep human needs and possibilities. Their mistake is to project their own capabilities onto everyone. In their home domain, it is a minor leap from knowing what can and should be done to actually doing it – it’s mostly a question of commitment. But on a large enough scale, this is a leap into an abyss. It is difficult for the Brights to see limitations they do not possess block projects, or even make them impossible. It is hard for them to accept that people may genuinely have preferences the Brights deem wrong. The Brights mark people Evil, Ignorant, and Weak to try to explain this discrepancy between potential and actuality. But even within their community, even on the smallest scale, they see people who don’t conform to their expectations. The Brights are driven by faith in human potential. It pains them to admit how little of their potential most real-life humans have realized. The Brights blame the system and want to reform it, but most people are below the minimum threshold to directly help with this reform. They must be guided. The Brights reluctantly place themselves in leadership roles. They know those roles look a lot like Evil roles, but the alternative is to give up on progress. They vow that their intelligence and morality will restrict their use of power to good. They become the Smart & Moral group at the core of an Enlightened Community. The ones who reveal the truth and direct the group in the fight against Evil. 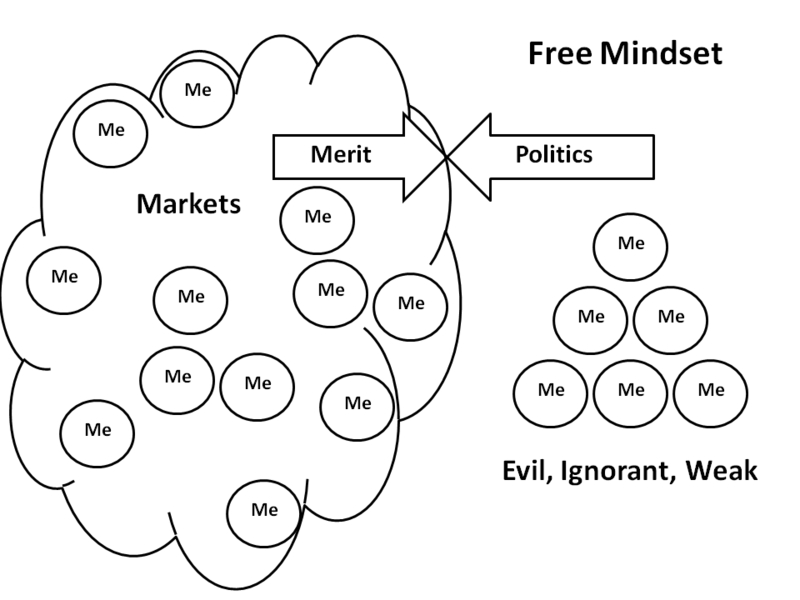 The Free mindset has the individual at the root. Universal theories and solutions are speculative opinions. While these opinions may be shared by people, there is no hope of universal agreement. There is nothing noteworthy or actionable about individuals disagreeing whether due to self interest or preferences or ignorance. The world is composed of a lot of individuals with needs and desires that not only conflict, but are often not understood well enough to be compared, even by the individuals themselves. It’s common for people to come to the Free mindset after experiencing, or even leading, failures of Bright efforts. There is no single best arrangement, no way to prevent corruption of leaders, no way to morally unite people or even to insure mutual understanding. Frees view optimization for individual freedom to be the best possible practical arrangement. Competition that results is both a requirement and a consequence of this freedom. Frees recognize that freedom is essential to reach human potential. That autonomy and accomplishment give us dignity and meaning. That success in a competitive market correlates with merit and that individual pursuit of success pushes societal progress. That while freedom and competition can seem inefficient, they encourage exploration and redundancy that make society less fragile and expose it to high-return long-shots. The Frees don’t necessarily claim that this process is theoretically the most moral or optimal, just that it works while being resistant to large scale pathologies of Bright’s projects. The Frees view the primary battle as between Merit and Privilege. They tend to view Politics as a tool the less competent use to protect themselves from competition. They despise the sense of entitlement among the Weak and the lack of identity among the Ignorant. Both groups are manipulated by the Evil leaders to use political power against market forces that are in actuality responsible for the lifestyles of the Weak and Ignorant. The Brights and the Frees both get a lot right. Their chief error is scope. The Brights extrapolate from introspection and specific experiences to universal human capabilities. The Frees extrapolate from failures of large projects and effectiveness of markets to undervalue loyalty and unity. I think the Brights are right that community and morality multiply effectiveness and give meaning, that we need recognition, that we are at our best when motivated by something higher than money. I think the Frees are right that there is no hope of universal agreement, that competitive interactions are a fact of life, that individual freedom is essential for happiness and actualization. 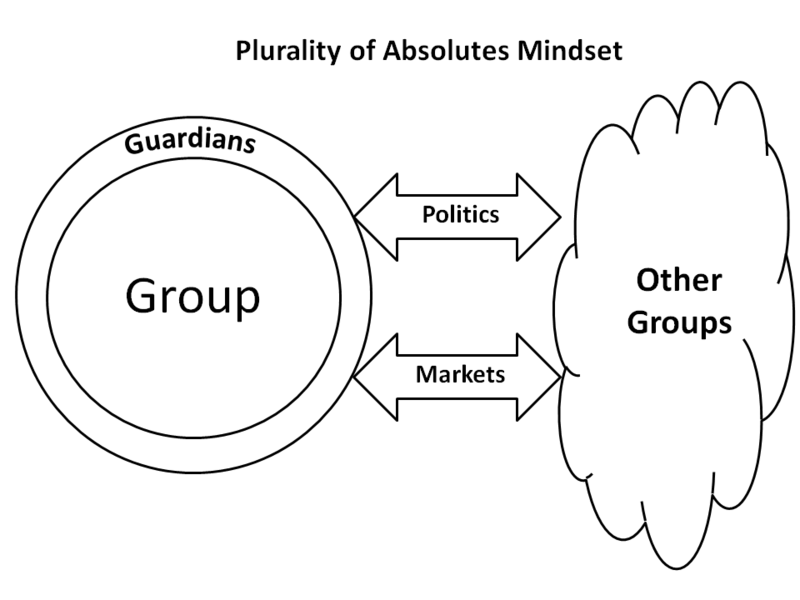 The Plurality of Absolutes is largely a synthesis of these mindsets. The world is composed of groups, each with their own purposes and values. It is an essential quality of groups that they do not agree. While points of agreement exist, so do deep, unresolvable, disagreements. Groups have a greater tendency to splinter than to unite. 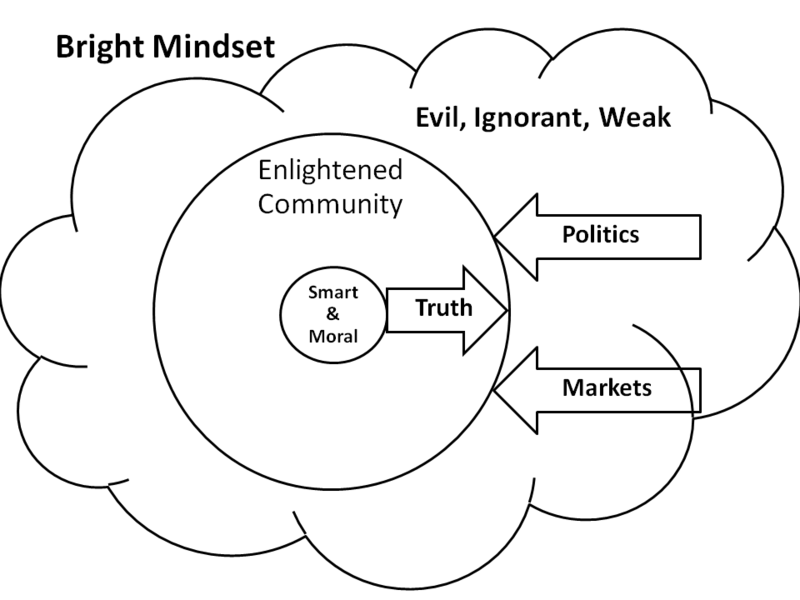 Discourse and truth, which are essential to the Bright model, are of limited value in intergroup interactions due to disagreements on truth, methods to find truth, value of compromise, preference for certainty, use of language, moral norms… Intergroup interactions cannot rely on deep trust enabled by common goals, commitments, and history. At least some interactions between groups must be competitive, even hostile, due to conflicts over interests and values; this makes all interactions suspect. Markets and politics are how entities that do not agree interact. These aren’t forces of evil or ignorance – those are even less relevant to intergroup interaction than discourse and truth. Morality does not cross the boundary of the group. Markets and Politics are amoral processes, the only ones available for interaction between the variety of groups in the universe. But amorality of Markets and Politics does not cross into the group either. Inside the group, both forces attack the relationship illegibility and moral faith that give the group its power and purpose. A push for markets is a push for division of groups into ever-smaller parts, culminating in groups of one. Fully zoomed out, the Plurality of Absolutes view looks like the Free view. Each group looks like a self-interested individual who pursues their own agenda with varying skill and self-knowledge. The merit of internal group values correlates with group competitiveness in the long term. When we zoom in on each group, it looks like the Bright view. Individuals united around a common purpose, with a common set of values, with expectations of internal justice and coherence. Members are woven together by shared history and illegible debt structure of past interactions. The group is justified to demand loyalty from its members and thus pursue long-term projects that require trust. The group is free to enforce compliance up to the point of taking away membership. The fairness of these decisions can unite or splinter the group, thereby changing its competitiveness in the battle between groups. When we zoom in even further, to the level of individuals, things again begin to look a bit like the Free view. Although interactions within a well functioning group aren’t driven by money, they are still driven by a form of market competition, just with different currencies. Individuals still need to resolve differences, gain influence, and compete for recognition. Even with the unity of goals and values, there are disagreements about the details. When those disagreements reflect more than individual flaws, groups splinter. This maximum zoom view also corresponds to periods of free agency and virgin group formation. Although each individual is looking for soul-mates to join or unite in a common quest, they cannot trust prospects or be trusted by them. Interactions are guided by standards of Markets and Politics, and shift slowly towards those of Community. 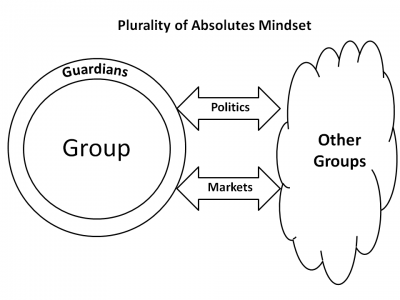 So the Plurality of Absolutes mindset strongly resembles the Bright one within the group and the Free one between groups. With an important addition: Guardians. Guardians are members of the group who are involved in interactions with other communities. Some examples are politicians, diplomats, attorneys, managers, executives, generals. Guardians are where the tragic meeting between the Bright and Free mindsets is inescapable. The Brights can maintain consistency behind moral certainty and truth. The Frees can maintain consistency behind amoral competitiveness. The Guardians have no such luxury. They must fight for the moral Bright values of their chosen side, but cannot escape the merits of alternate approaches or the use of amoral Free means. Furthermore, they must project external amoral reality onto an internal moral stage. This task is necessarily impossible – it can only be done better or worse. Like Greek heroes, they face inevitable tragedy. Since they get caught in actions deemed immoral by the community, they cannot hope for recognition by the group. Even the best possible choices expose them to group disapproval and punishment. When recognition does come, it is often fleeting and theatrical. The truer they are to their cause, the harsher the punishments they must risk. With uncertain internal support, primary recognition from fellow guardians and adversaries, and only internal coherence to guide them in their own unique journey, it isn’t unusual for Guardians to switch sides or become Free Mercenaries. Such examples seem to confirm the Bright assertion that Guardians are Evil outsiders. There are few ways to tell apart the Guardians who give up from those that are still part of the group. And yet, the strength and effectiveness of Guardians is essential for success of the group. In turn, it is the integrity of the community and its members that tells the Guardians that their side is worth fighting for. Recognition and understanding are rarely possible between Brights of conflicting groups, Brights and Frees, Brights and Guardians, and Frees and Guardians. You talk to find others who agree, not to convert those who don’t. You neither expect recognition from outsiders nor feel the need to defend yourself against their accusations. Your sense of self-worth depends on performance within your group standards and within your own sense of integrity and coherence. You accept that it may be impossible to avoid choice between conflicting goods or the responsibility for such choices. You pick your side freely and act to further its goals. It is a fact of life that others pursue purposes antithetical to yours. To accept this, is not to accept all purposes as equal. It is to decide to compete by doing, not by fuming and arguing. The world will never be one united group, but if you wish, you can have your world consist of united groups. I like where you’re going. It seems there are a number of dimensions to each of these groups (brights/frees/guardians). The bright/guardian distinction can apply to an individual’s position relative to the group, as you are using it here, but also to the morality of the group itself. Bright groups have the universal, inclusive, somewhat naive character that you describe nicely. Guardian groups have a more competitive feel. Though this competitiveness does play out in markets, it doesn’t originate there. The same values can be seen in non-market contexts. Guardian groups have a culture akin to an adult intramural sports league: the participants are all friends but they also want to win and believe that friendly competition brings out the best in each other. Bright groups are more like a kids’ sports league: everyone gets a trophy and the belief is that positive reinforcement and encouragement brings out the best. I really like your point about Brights taking on Guardian characteristics at the intersections between groups. The inverse happens as well. A Guardian group that outcompetes its rivals must by necessity become more inclusive (less elitist) as it grows. This is the mirror image of the evaporative cooling effect. What looks like dilution from one perspective can also look like inclusiveness from opposite perspective. The Frees differ from both Brights and Guardians along a different dimension. Because both Brights & Guardians take the group as their starting point, their ethics revolve around many-to-many interactions. The ethics exhibited by Frees have hints of those same bright/guardian values but they take on a different flavor when used to evaluate one-to-one interactions. Thanks Gregory. Guardians can themselves be a group with its own purpose and code of ethics. For example, opposing soldiers may share more with each other than with the sides they are defending. It’s not uncommon to belong to multiple groups like this. I haven’t thought about categorizing various group purposes along Bright/Free/Guardian dimensions as you are doing. Brights don’t have to be competitive so I think I see where you are going. But they aren’t necessarily uncompetitive. It’s just that when they compete it’s towards a shared goal – think of a scientist pursuing truth – or towards a universally acknowledged good – think of honor. For Frees and Guardians competition is an accepted necessity, the question is just who’s goals they compete for. They don’t expect goals to be universal. So in my model groups built around positive reinforcement or friendly competition could have a Bright or PofA mindsets. Agreed that competitiveness doesn’t originate in markets. Also agree that when groups win in a competitive battle (your example of Guardian groups) they change significantly. I don’t think large groups can avoid dilution of shared purpose and hence their success reduces their competitiveness. A process similar to creative destruction. Fascinating post. I especially like the nuanced descriptions of the Bright and Free mindsets, which ring true. I wonder whether there’s more to say in the last section, about living with the Plurality of Absolutes. You make a convincing case that, at a certain point, it’s unproductive to debate members of other groups. At the same time, it seems as though a person that accepts your critique of universality would be especially well equipped to engage in constructive (if restrained) inter-group dialogue. Perhaps your goal is not to discourage such dialogue categorically but only to avoid the kind that devolves into angry wheel spinning. It’s become a common observation that the current media and social media environment has increased the prevalence of echo chambers and political polarization, which many consider harmful to the prospects for democracy. How do you think about charting a course between (1) unproductive dialogue between groups and (2) potentially harmful levels of disengagement? It depends on the purpose of such dialogue. If it’s to enable pragmatic engagement, then productive inter-group dialogue happens all the time through markets and politics. If it is to try to generate publicly accessible descriptions of groups, then it’s the domain of intellectuals whose group values place commitment to the truth above other loyalties. There is plenty of space in both for people capable of seeing both sides. Attempts to influence members of other groups outside of markets and politics are a poor use of time. To the extent that the saved energy flows into productive activity, which might then influence the conversation amorally, it is a gain. Whether silos are harmful for democracy depends on how one views democracy. One can look at it (Freely) as basically a market with alternate currencies. Silos aren’t much of a problem here. Or one can look at it (Brightly) as a way for group members to converge. Dialogue is then no longer inter-group. Disagreements are subservient to the values agreed upon. Silos endanger the ability to recenter on similarities. An essential value that makes such in-group democracy function is civic virtue: the willingness to cooperate despite disagreement. Whatever conflicting goals subgroups have, their achievement must not sacrifice the values that unite the subgroups. Otherwise civic virtue erodes. I think that such erosion has been going on for generations and that it, rather than insufficient dialogue, is the main culprit. I doubt dialogue can still reverse the erosion on any meaningful scale. I think there is a cycle where things like civic virtue get built up during difficult times when we must focus on our similarities and then get used up during easy times when we have the luxury to focus on our differences. Thanks, that’s helpful. It’s interesting that you raise the example of intellectuals qua “group.” That caught me by surprise, since your definition of group is partly based on mutual loyalty, and I’ve never thought about intellectuals as particularly loyal to other intellectuals broadly speaking, even if they understand themselves as sharing an overriding commitment to truth. Anyway, I think the problem that was preoccupying me sort of gets defined away when “group” is construed this broadly. That’s not a criticism of the model; it’s just an observation that nuanced differences in one’s understanding of the “group” may have important consequences. Yep, it’s a very general model. I kind of had the feeling that it might not be directly applicable to your concern. A crucial question for PofA is what ties individuals to the group and justifies sacrifices. The Bright answer is ultimately truth/righteousness. But once you reach a point where truth can’t be proven you are basically left with loyalty. The Free or lazy version isn’t much different. This is the point of group boundary for purposes of PofA. I see how loyalty and intellectuals seem contradictory. I think some of it is addressed by people belonging to multiple groups, with some groups being as small as one person. And most should be addressed by switches between Free and Bright outlooks at different scopes. Intellectuals show loyalty as a group when core beliefs such as objectivity or free speech come under attack. But I am not certain that those address everything. I haven’t yet developed the loyalty idea fully so my group definition might simply not be precise enough. Thanks for your thoughtful response. This makes sense to me.